The Blyth Festival is one of my most favourite places to visit and last Friday night was no exception. It was the Opening of the festival’s 41st season. As is typical on the grand Opening, avid theatre fans and major sponsors gather for a Gala Dinner. This year, as has been a tradition for many now, the Legion Ladies Auxiliary served a bountiful country-style roast beef dinner. 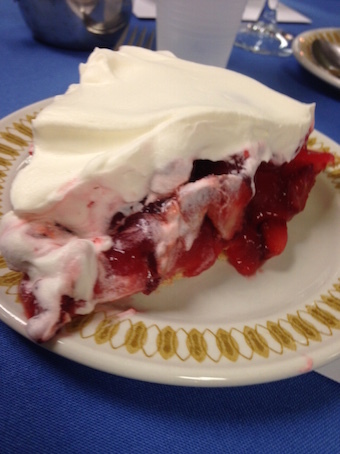 And, I was happy to see the lip-smacking fresh strawberry pie for dessert. It was as delicious as I expected it to be. And … more importantly, guests at my table were delightful company with which to enjoy a repast. Garratt introduced the evening’s keynote speaker, Mark Crawford. Crawford’s successful play – Stag and Doe, which premiered at Blyth in 2014, is currently enjoying seven independent productions in theatres across Canada. This seemingly “instant” success is rare with a new play, but carries a tradition of plays developed and premiering on the Blyth stage that have a life beyond Blyth and confirming that “our” stories are universal in appeal and relevance. Crawford shared that he was most struck by the relationship between the artists, the art and the audience at Blyth. 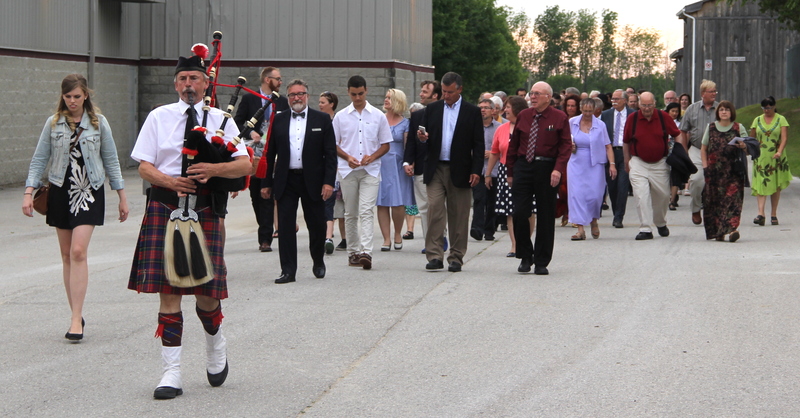 Following dinner, we were led by piper Jeff Wise on the short walk down to the theatre in Blyth Memorial Community Hall. The Opening Night production was the docudrama Seeds by Annabel Soutar. 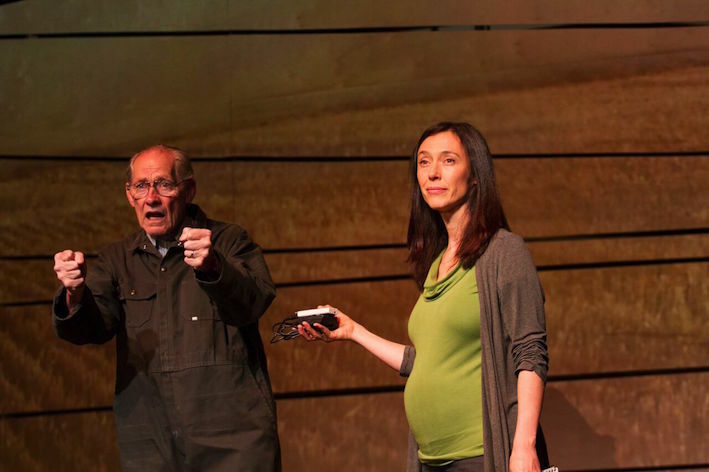 Although not a new play, this was a new production that embraced new technologies in its telling of a modern, true-life farming story. Seeds opens with a thought-provoking question – “What is Life” – and thereafter follows the story of Percy Schmeiser, a Saskatchewan-based canola farmer, who takes on Monsanto, an agricultural bio-tech firm that licenses crop protection chemicals and seeds to farmers worldwide. Monsanto sues Schmeiser for illegally growing genetically modified seeds on his land. Schmeiser claims the seeds blew onto his land and that he didn’t plant them at all, taking it further in fact to admit he knew very little about genetically modified processes and practices. The supreme court sides with Monsanto with deep implications and questions of the power of “life being created in a test tube”. And if “life” can be patented, who’s responsible for those who act in an unpredictable ways? Director Kim Collier skillfully orchestrated through the mound of complicated content to guide this production in a way that had me, at times, sympathetic to both sides of the issue. Equally strong was veteran actor, Severn Thompson, who played a young playwright adamant about finding the truth. She was curious and vulnerable as she guided the audience through the complexities of this true-life case. The supporting cast – Keith Barker, Rachel Cairns, Jason Chesworth, Jeff Irving and Tracey Ferencz – ably played multiple roles including lawyers, scientists, and family – including Schmeiser’s quirky wife, Louise. The set designed by Steve Lucas integrated a seemingly simple backdrop and moveable pieces that worked as lab desks, court tables or the kitchen table. (I say “seemingly” as my experience is that technically that’s not always the case.) Digital technology projections on the backdrop were used to quickly change the setting from the farm to a high-tech lab, a courtroom and other sites as the script demanded. It worked, although personally I find rolling set pieces do get distracting and in this hugely complex production there were a lot of (necessary) scene changes. Contemporary costumes were designed by Karyn McCallum, lighting and projections were designed by Beth Kates for Playground Studios Inc. The stage management team included Crystal MacDonnell and Christina Cicko. As I mentioned the content of this play is complex and the volume of information shared begs a second viewing from this theatre fan. It’s asks some important questions for us to ponder about the safety of our food supply and our need to increase yields at the expense of “life”. Challenging, informative, and most of all entertaining, Seeds plays in repertory at the Blyth Festival until Aug. 8th. Tickets: Adults: regular $30, preferred $34; Preview: regular $22, preferred $26; Youth: regular $15, preferred $15.